Dr. Mukund Chorghade has over 25 years of experience in drug discovery, chemical route selection, process development and formulations for academic and industry-sponsored research on New Chemical Entities and generics. He currently serves as President of Chorghade Enterprises, Inc. and as Chief Scientific and Technology Officer, THINQ Pharma, where he consults for Major American and European pharmaceutical companies on collaborations with worldwide academic, government and industrial laboratories. Dr. Chroghade was the recipient of three “Scientist of the Year Awards” and had the honor of being a featured speaker in several national and international symposia. He has published 5 books and hundreds of articles in drug discovery and development. Dr. Chorghade serves as an adjunct faculty member at Harvard, MIT, Northeastern, Caltech and Cambridge Universities. He also serves on the board of directors of the Northeastern Section of the American Chemical Society as well as on numerous international and U.S. scientific advisory boards. Bull. Chem. Soc. Jpn. 2007, 80, 1451-1472. Chiral glycolic acid equivalents are used extensively for the enantioselective synthesis of α-hydroxycarbonyl compounds. Their efficacy in enolate reactions and their utility in synthetic applications are discussed, highlighting the relevance of these methods to natural product synthesis. • “Alkyl Amines Padma Bhushan Prof. B.D. Tilak Chemcon 2002 Distinguished Speaker Award” of the International Institute of Chemical Engineers. • "B. D. Tilak Distinguished Visiting Fellowship", University of Bombay. • Listed in "American Men and Women of Science", "Who's Who in Science and Engineering". Jackie O'Neil (Alkermes, Inc.) and Mukund Chorghade (THINQ Pharma). (l-r) Rajeev Chorghade (Carnegie Mellon University), Sandy Hoffman (Sharon, MA), Kathy Lee (Pfizer), Mukund Chorghade (THINQ Pharma). Dr. Mukund Chorghade is currently President of Chorghade Enterprises / CP Consulting, Inc. in Natick, MA, and Chief Scientific Officer of D & O Pharmachem. Dr. Chorghade provides consultation to major American and European pharmaceutical companies on collaborations with worldwide academic, government, and industrial laboratories. He earned his Bachelor of Science and Master of Science degrees from the University of Poona in India; and earned his Ph. D. in organic chemistry from Georgetown University in Washington, D.C. He has had postdoctoral and visiting scientist appointments at the University of Virginia, Harvard University, University of British Columbia, and College de France/Universite’ Louis Pasteur. He has also directed research groups at Dow Chemicals, Abbott Laboratories, and CytoMed. Currently, he is an adjunct faculty member at Harvard University, Massachusetts College of Pharmacy, University of Pune, Wellesley College, and Tufts University. Dr. Chorghade is the recipient of several “Scientist of the Year” awards, has been a featured speaker at national and international symposiums, and is a member of the American Chemical Society, Maharashtra Academy of Sciences, Royal Society of Chemistry, New York Academy of Sciences, American Institute of Chemists, Indian Society of Bio-Organic Chemists, AAAS, and Sigma Xi. Dr. Chorghade is the committee member for medicinal chemistry and drug development with the International Union of Pure and Applied Chemistry (IUPAC). He is an entrepreneur in the fields of bio fuels, bio transfer and development of rational medicine. He currently serves as the President and Chief Scientific Officer for THINQ pharma and Chorghade Enterprises. He is also an adjunct research professor at North-eastern University and has appointments at Harvard and MIT. He provides synthetic chemistry and development expertise to pharmaceutical and biopharmaceutical companies, also provides consultations on collaborations with academic, government and industrial laboratories. He advises technology based companies on process re-engineering and project management of technology transfer; establishes strategic partnerships and conducts Current Good Laboratory Practices (cGLP)/Current Good Manufacturing Practices (cGMP) compliance training and implementation in chemical laboratories. He oversees projects in medicinal chemistry, chemical route selection, manufacturing and formulation of bulk actives to finished dosage forms. Dr. Chorghade is an OCI, born in Jabalpur, Madhya Pradesh, having connections with Nagpur and Pune, who became a US citizen in 1990. He travels to India six times a year to stimulate business. Dr. Chorghade earned his B. Sc. and M. Sc. degrees from the University of Poona, and a Ph. D. in organic chemistry at Georgetown University. He completed postdoctoral appointments at the University of Virginia and Harvard University, visiting scientist appointments at University of British Columbia, College de France/Universite’ Louis Pasteur, Cambridge and Caltech and directed research groups at Dow Chemicals, Abbott Laboratories, CytoMed and Genzyme. A recipient of three “Scientist of the Year Awards”, he is an elected Fellow of the American Chemical Society (ACS), American Association for the Advancement of Science (AAAS) and Royal Society of Chemistry (RSC) and has been a featured speaker in several national and international symposia. Dr. Chorghade is also a board member and scientist with NCORD India Limited (www.ncordindia.com), a niche cell based therapy and research centre located at Pune, incorporated in March 2011. Dr. Chorghade got associated with it through Mr Nilesh Kanade, a deep strategic thinker and visionary who conceived the idea for NCORD India. THINQ Pharma has an office in Mumbai. Dr. Chorghade has several reasons for getting motivated to set up the venture in India. According to him, India occupies the seventh largest land mass in the world; nearly a billion people living in its boundaries make it the second most populous country. India is a melting pot of a myriad of races, languages and religions; and operates with primitive as well as sophisticated technologies. These dichotomies in the world’s largest democracy have lent an exotic flavour to India. He has remained an effective Ambassador of the country in the chemical community. He returned to India because of the following reasons. He feels that the growth of science and technology in India in the post-independence era has been impressive. The country now possesses a well-developed Western style legal/administrative structure, a proficient and competent civil service bureaucracy and considerable support and enthusiasm among the populace for betterment of life through science. The academic and publicly funded institutions have provided a steady stream of multi-lingual, mainly English speaking, educated manpower. The scientific manpower pool is the second largest in the world; many of the country's technocrats, scientists, and engineers have been trained in the finest laboratories of Europe and the USA. Modern instrumentation is readily available; numerous laboratories, pilot plants, and manufacturing facilities conforming to stringent specifications of GLP and cGMP have been established. These facilities have received regulatory approvals from international bodies such as the US Food and Drug Administration (FDA), Medicines Control Agency (MCA-UK), Therapeutic Goods Administration (TGA-Australia), Medicines Control Council (MCC-South Africa) and the World Health Organisation (WHO). Total Quality Management programs are in place in the leading professionally managed institutions, with noteworthy improvements in product quality and reliability. Talking about his experience of setting up NCORD India, Dr. Chorghade stated that India is a land of immense potential with a large young and skilled work force; however, the mind set for research and inventions is missing in India. While, the workforce in India is adequately skilled for normal operations, the high skill set required for research is missing both in terms of knowledge base as well as the mind-set for research. Another key factor is that there is little incentive for performing research in terms of research investment from corporate or government grants. Most of the organizations are risk averse and there are very few corporate who are interested in funding large research activities in India. According to him, the increasing demand for reliable medicines and drugs, coupled with the increasing number of people crossing over the age of 60, is opening new doors for pharmaceutical companies. In such a scenario having life-saving drugs rationally developed in-house at a very rational pricing could not only cater to a large market success but would also be a big social phenomenon for the country. His company THINQ Pharma, headquartered at Singapore has brought special expertise in its India operations. There has been a noticeable paucity in the development of New Chemical Entities globally. With THINQ Pharma, Dr. Chorghade makes a strong case for a new drug in the international marketplace allied with the discovery and development of compound libraries that can be licensed for a range of therapeutic applications. THINQ Pharma represents new paradigms of drug discovery and development. The objective of the company is to target Natural Products and to derive inspiration and intellectual value to discover and develop New Chemical Entities for a variety of pharmaceutical, agrochemical and cosmoceutical applications. While biotechnological advances, genomics and high throughput screenings or combinatorial and asymmetric syntheses have long promised new vistas in drug discovery, the pharmaceutical industry is facing a serious innovation deficit. Post marketing failures of blockbuster drugs have become major concerns of industries, leading to a significant shift in favour of single to multi targeted drugs and affording greater respect to traditional knowledge. Drug Discovery using observational therapeutics scientifically validated and standardized botanical products can be explored on a fast track basis using innovative approaches such as reverse pharmacology, systems biology and Information Technology. Many natural product discovery programs utilize biologically active natural products as an advanced starting point for discovery. These can be considered “pre-validated by nature”, having been optimized for interaction with biological macromolecules through evolutionary selection processes. A diverse source of novel, active agents serve as leads/scaffolds for elaboration into desperately needed efficacious drugs for a multitude of disease indications. THINQ’s unique access to discovery and development quantities of isolated natural products with known biological activity through collaboration with practitioners of Ayurveda, Yoga and Naturopathy, Unani, Siddha and Homeopathy (AYUSH) in India, combined with their high speed medicinal chemistry know-how, creates an increased chance of yielding pharmacologically active final products. THINQ has also successfully developed a proprietary oxidative catalyst (commercialized under the name Biomimiks™) to conduct and predict metabolic profiling of drugs (in vitro and ex vivo). Biomimiks™ can screen a series of compounds by reacting them with permutations of their patented oxidative catalysts, co-oxidants and non-aqueous solvents. This powerful combination serves as an “in vitro cocktail” that reduces the elapsed time for drug screening from several days to hours. In addition, Biomimiks™ can be used by clinicians to dynamically measure a patient’s response (drug-to-drug interactions, dosing levels and regimens) to a spectrum of drugs and incorporate the results into more effective diagnosis and patient treatment. Dr. Chorghade says that he faced initial hurdles in establishing his business in India such as entrenched bureaucracies, lack of employable graduates with the requisite skills and a perception that NRIs are here only to “exploit” India. But eventually everything fell in place. Dr. Chorghade and his team have generated a lot of Intellectual Property (IP) but are not yet generating revenues. The revenues will see exponential growth after product licencing. His advice to upcoming entrepreneurs is “Stay the course. Be optimistic and persistent.When success will be yours, young and old, shy and bold will be equally affected”. Dr. Chorghade wants the entire perception of research in India to change. He feels that research and scientific activities have to be promoted and incentivized to such extent that people start looking up to them. This coupled with innovative learning procedures at the institutions to promote research is crucial to develop the much required research mind-set in India, according to him. Along with this, he says India must also develop streamline funding prospects for long term collaborative researches. Government should facilitate information exchange regarding research, research capabilities and facilities and provide encouragement, inspiration and problem solving guidance to new domestic and NRI/ OCI researchers and scientists. Mukund Chorghade is President of Chorghade Enterprises and Chief Scientific Officer at THINQ (Technology, Health, Innovation, Novelty and Quality) Pharma, where he provides consultations to pharmaceutical companies on collaborations with academic, government and industrial laboratories. He is also a member of the IUPAC Chemistry and Human Health division. What inspired you to become a chemist? My father bought me a book called Chemistry Creates a New World by Bernard Jaffe when I was a teenager. It opened my eyes to all the wonderful things that chemistry can do. I read it from cover to cover in a day and I was spellbound by a chapter on new pharmaceuticals. I decided that this was what I was going to study, much to the dismay of my father, who wanted me to be a physicist. When did your interest in natural products begin? "In India, there can be a gulf between the academic and industrial worlds. Some very good work from industry using state of the art techniques doesn't see the light of day." When I started studying chemistry, a lot of the organic chemistry research was focused on natural products. In India, many professors were working on the isolation of natural products from traditional sources and I was fascinated by the rich variety of structures. We have come full circle because there is now an increased emphasis on the new ideas of reverse pharmacology. This concept brings natural products we have used for centuries back into mainstream sciences and proves the therapeutic efficacy due to their structures. What projects are you currently involved in?At THINQ (Technology, Health, Innovation, Novelty and Quality) Pharma, we define new scalable process routes to new chemical entities. Someone could approach us with a medicinal chemistry route and ask us to make it more efficient, or to find different routes. Our goal is to make the drug better, faster and cheaper. We develop these routes and transfer the technology to larger manufacturers. We are also involved in contract medicinal chemistry where we synthesise compounds and analogues; we aim to do the drug discovery work ourselves using collaborations we have established with academics. One goal is to work on hybrid molecules; for example, the antimalarial drug Artemisinin, which when bonded with another drug, gives you a product that can be used in oncology. What was your proudest moment? In my industrial career, I was involved in the discovery of new processes, in particular a route to an antiepileptic drug called Tiagabine, which is now sold as Gabitril. My grandmother had suffered from epilepsy so it gives me a lot of pleasure to see a prescription filled using these particular antiepileptics. I also had the good fortune to develop a new technique called metalloporphyrin-assisted synthesis of drug metabolites that was useful in identifying drug metabolites and preparing them on a good scale. The technique, a predictive tool, could lead to a reduction in the use of animals for testing. You are president of Chorghade Enterprises. Why was the company established and what is its role? I set up this consulting company after my industrial tenure at Dow Chemicals and Abbott Laboratories in the US. At that point, there was a need to effect strategic collaborations between US and European pharma companies and their Indian counterparts. What started with process chemistry and manufacturing has expanded into medicinal and clinical chemistry. You are also Chief Scientific Officer at THINQ Pharma. What are the aims of this company?THINQ Pharma is a relatively new establishment that aims to inject new thinking in medicinal chemistry into the pharmaceutical enterprises. We are very privileged to have several outstanding Indian, European and North American academics and industry professionals on our scientific advisory board. 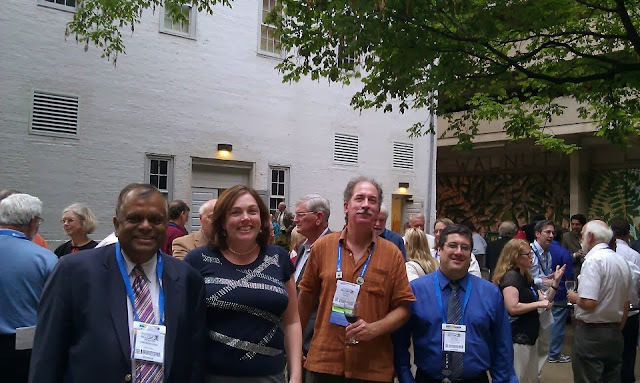 What is your involvement with IUPAC?As a member of IUPAC's Chemistry and Human Health division, I have carried out some successful projects. These include compiling new glossaries of terms used in process chemistry and pharmaceutics and producing a report on the use of natural products in traditional medicines in India and China. What is the situation for the pharma industry in India?Drug discovery as a science is in its infancy, but is a rapidly growing area. Historically, the World Trade Organisation approved deals to allow poorer nations to import generic medicines manufactured in India and China, overriding international patents. Recent changes in the patent laws resulted in increased impetus for Indian pharmaceutical companies to invent new drugs. The government in India has been extraordinarily supportive of such ventures. There are a lot of new initiatives and some pharmaceutical companies have begun the research. As yet, there is no Indian drug on the market but I'm very optimistic. Do academia and industry collaborate successfully in India? In India, there can be a gulf between the academic and industrial worlds. Some very good work from industry using state of the art techniques doesn't see the light of day because of patent and confidentiality issues. Another problem is the lack of industrial scientists delivering lectures in symposia. Industry and academia need to be encouraged to collaborate more in order to obtain research funding. We have unique systems in India, where a lot of PhD work is done in very good institutions like the National Chemical Laboratory in Pune and the Institute of Chemical Technology in Hyderabad; these institutions do not grant their own degrees - there's a symbiotic relationship with universities. Could you tell me more about the National Chemical Laboratory (NCL)? The NCL is a constituent laboratory of the Council of Scientific and Industrial Research (CSIR), an umbrella organisation, covering 40 national laboratories. Nine or ten of these cater to the chemistry enterprise. The CSIR employs about 23,000 professional scientists. A large number of students elect to pursue PhDs at the NCL; it has become an outstanding institution for promotion of higher learning because many of the full time scientists are distinguished people in their own right. They work across the borders of pure academic work as well as industrial collaborations. I have the highest regard for them and I've published papers with some of the scientists there. What is funding like in India? "I'm a tremendous supporter of chemistry, and not just because I am a chemist. I feel that chemistry is still the central science." Now there are increased motivators for doing research in India, the whole scientific infrastructure has increased in size, sophistication and financing. The Indian government has announced many new initiatives where they will fund projects. If you have a good idea and if you can carry out the pioneering research, the government will fund it. Pharma companies in the West have been increasingly looking to India as a font of innovation. How do you see the future of chemistry developing?I'm a tremendous supporter of chemistry, and not just because I am a chemist. I feel that chemistry is still the central science. Sometimes there are new trends and some might say that the computer can solve all your problems, or that biology can solve all the problems. That is not the case. Chemistry, biology and all these other disciplines need to work synergistically with each other. I would not downplay the importance of chemistry. What's your advice for young scientists?Follow your heart. Do what you are interested in doing and don't be swayed by short-term trends. Have a basic honesty and integrity in your work. Do not do something for the sake of awards, do it because you love the basic science. Then the awards will come. If you weren't a scientist, what would you be?My second choice would have been to join the diplomatic service. I dreamt of joining the Indian civil service, in particular the foreign service because to me, developing good international relationships is very important. I'm happy to say that in a modest way I am an international ambassador for Indian science and chemistry. There is a joy in meeting talented people from a variety of scientific, cultural and ethnic backgrounds. We are all in this together. Mukund Chorghade (Thinq Pharma) with his wife, Veena, and son Rajeev (Carnegie Mellon University). 3/20/2014 Chiara, Katie, Meaghan, and Nick all presented posters at the 247th American Chemical Society National Meeting in Dallas. Below is a picture of the students with Mukund Chorghade, collaborator and founder of Empiriko. 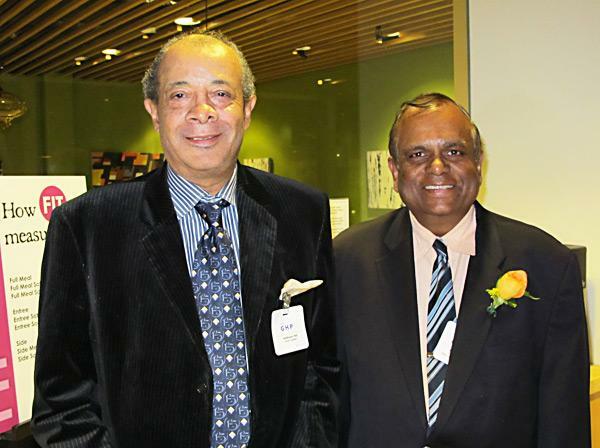 ACS Division of Small Chemical Businesses (SCHB)and local section NESACS members: Jack Driscoll & Mukund Chorghade at November #NESACS Meeting at AstraZeneca #IYC2011 #chem_amb — with John Jack Driscoll. 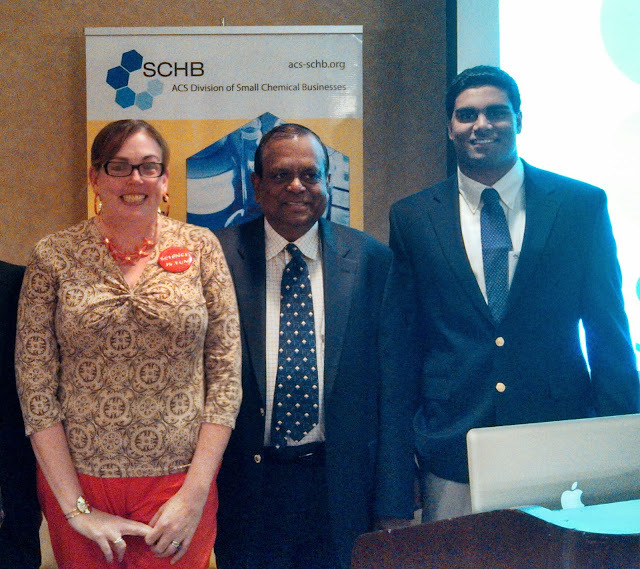 Last week at the Southeastern Regional Meeting of ACS (SERMACS) in Raleigh, NC with Mort Hoffman, NESACS Councilor, Shrikant Kulkarni, Organizer of the Entrepreneurial Chemistry: Academic/Industrial Interactions day long symposium and Mukund Chorghade, NESACS Professional Relations Chair and symposium presenter. with Dr. Mukund Chorghade — at Harvard University. After the Learn how to satisfy your entrepreneurial career cravings workshop Saturday at AAAS - The American Association for the Advancement of ScienceMeeting led by Jennifer Maclachlan, SCHB PR Chair, featuring workshop presenters from L to R: Mukund Chorghade, SCHB Immediate Past Chair & NESACS Professional Relations Chair and Jack Driscoll, NESACS PR Chair & SCHB Member.